While in Cambodia, we made sure to buy a three-day pass for the temples. Partly that was to have enough time to see all the ruins at a leisurely pace, but I also wanted more than one shot at getting a sunrise photo over Angkor Wat. On our first morning, we had our tuk tuk driver pick us up at 5am. He dropped us off at the gates of Angkor Wat and told us to try to set up in front of the northern reflecting pool which, he said, was the best spot to get the sun, the temple’s spires, and their reflections all in one shot… at least in December. That early, it was still pitch black. Without our flashlights, I’m sure we would have tripped on the uneven paving stones of the causeway. By the time we reached the reflecting pool, almost every available spot had been taken. We set up on the extreme right edge where we could still get some water in the shot, but unfortunately the grassy edge of the pond dominated the frame. At least the sky was clear. The best photos we got that morning – when the heavens were still changing from black to purple to red – were well before the sun actually came into view. We resolved to make another attempt the next day and arranged for our driver to have us at the gates just before the park officially opened at 5am. Those extra 15 minutes made all the difference. While other people made it into the complex before we did, Oksana and I were the very first ones to the reflecting pool and we even had about five minutes to choose our spot. By the time I was extending my tripod’s legs, other people were staking their claims. This time we were set up on the opposite side of the pool. The sky was very different that morning. There was a low cloud cover that was being pushed by the wind. 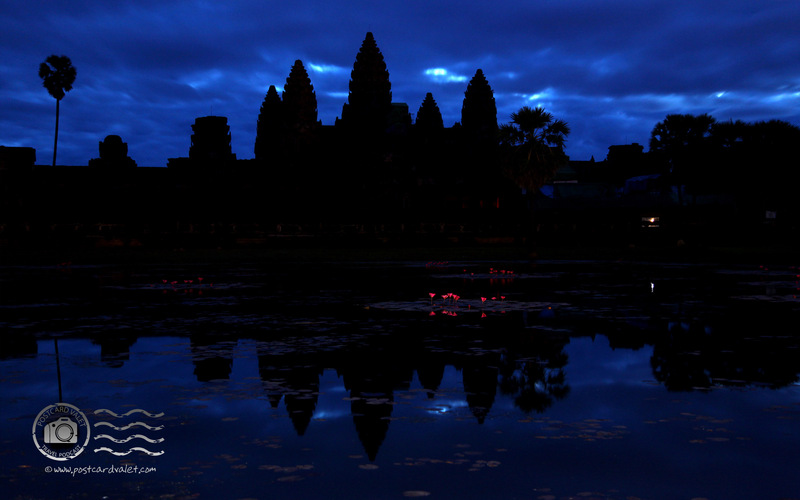 Clouds came from beyond the Angkor Wat, floated over the temple, then over our spot at the reflecting pool. It never looked like it was going to rain, but those clouds prevented us from ever seeing the sun directly. Many, many of the tourists crowding around us were cluelessly taking flash photos with their point-and-shoot cameras. Most of them were either unaware that their tiny flashes wouldn’t illuminate much beyond 10 feet, or didn’t know how to turn them off. At any rate, Oksana and I commiserated about how annoying it was to have a hundred strobes going off in the dark every minute. Later, when we were reviewing our photos on a laptop, we discovered an unintended and wonderful consequence of all that added light. While even 50 flashes were not enough to lighten the face of the temple, their cumulative brightness was enough to paint the pink water lilies out on the pond with their light. Before taking this photo, I had strapped a camcorder to one of the tripod’s legs and let it record the sunrise as I snapped away. Unfortunately, my camera work periodically shook the tripod and the final result is less than perfect. Even after stabilizing the footage in After Effects, there’s still a sort of smooth bumpiness to it, but I decided to upload it anyway, because I think it’s pretty cool to see all those clouds streaming past. View the same video in high-definition (720p) on Youtube.